This is quite a boring knit but am working on it most evenings watching telly. This shot was taken a few days ago and was about 18″ in diameter but I’m about 20″ now. 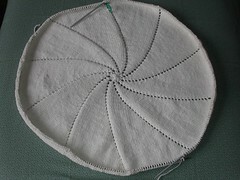 Working it on one circ is getting uncomfortable, so it’s being worked between two 80cm 4mm circs now. I’m thinking I’d like it to be about 30″ or so, we’ll see how far we get! Pattern is here if you haven’t seen it already. I love these cards so much, I had to share them with you. Those of you in the UK, they’re available from the Art Group and John Lewis sells them widely. 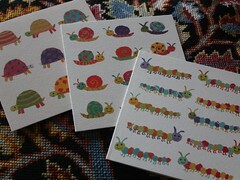 Sarah Battle’s work is fabulous and they’re my cards of choice for little people everytime. Her background is in printmaking and textiles and she graduated from the Royal College of Art in 1991.